Richard Stokoe, interim head of media and external relations at Brent Council, shares insights ahead of his crisis simulation session at the PR Summit. From a flailing panic about the rise of social media and how to manage it, the PR sector has evolved to grab digital platforms by the balls, given them a little tweak, and professionalised its relationship with how to use this new world for the benefit of companies and clients. In your opinion, what will 2014 bring to the PR profession? The ever quicker march of PR becoming more about science than art. Its all about the numbers and the analytics and not the sentiments. If you had one recommendation for those looking to deliver an integrated comms strategy in 2014, what would it be? Be someone who knits. Have a checklist of all disciplines of PR on your wall with lead in times so you can do your integration properly. Think about how below the line media, social media, public affairs, internal, digital and web work will knit together with above the line disciplines of design, advertising, marketing and events in timescale, voice and messaging. What would your top three tips on engaging and interacting with your audience be? Be human, know who you are talking to, put your self in their shoes. What session, other than your own, are you most looking forward to at PR summit? So many to choose from that are intriguing or give a fascinating insight into the way PR is morphing and changing, evolving and revolving. I will stump for "Effectively Managing Reputation In The Global Landscape" or "Delivering A High-Impact, Integrated Comms Strategy In 2014". I can’t make up my mind which I am more excited about. 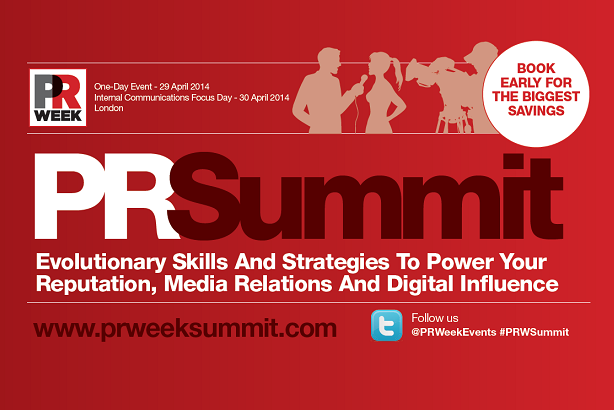 Richard Stokoe will be speaking at the PR Summit on 29 April. Find out more about the event, including details of the day's agenda and other speakers.